At the start of the summer I kept nagging my daughter to get rid of a pair of eight year old VANS. When she finally did and I saw them in the trash, I became a little nostalgic (since she had them since 5th grade) and took them out of the bin. I felt so silly because now I had the ratty old shoes and didn't know what to do with them so finally I decided to paint them. Since I started working with gourds I rarely paint on canvas. When I do, it feels odd because I've gotten accustomed to working on a curved surface. 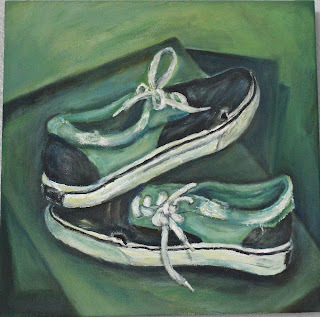 It was fun to paint again and when I finished I had no problem throwing away the shoes. I see a whole series of paintings coming my way...perhaps a good way to get rid of things and get some painting practice in! So happy to see a post on your blog. The shoes look ragged but nice. Good job! Do you want me to send my old canvas shoes your way?